Raft the Lower Salmon River. Get 6 months to pay $835.00 with PayPal Credit! No payments + no interest if paid in full in 6 months. The Lower Salmon is a boater's dream, with exciting pool-drop rapids, stunning canyon scenery, and white sand beach camping. 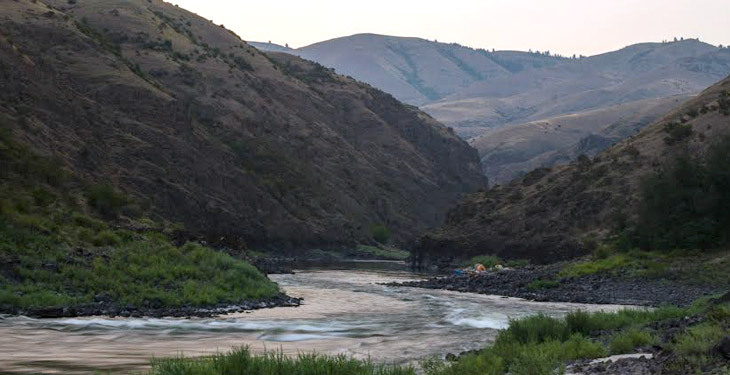 No traffic or cell phones – just the splash of rushing whitewater as you ride the river through deep arid canyons accessible only by the Salmon River. The Salmon is the largest free-flowing river in the lower 48 states, and the route takes you through the two deepest river gorges in North America, traversing parts of Idaho, Oregon, and Washington. From the launch site near Whitebird, Idaho, wind your way through the rugged Salmon River Gorge to join the Snake River in Hell's Canyon. From the confluence, float the last roadless miles of Hell's Canyon to the take-out at Heller Bar near Lewiston. Join your guide and fellow adventurers in one of the rafts, or challenge the river solo in an inflatable kayak. This 55-mile stretch of the Salmon and Snake Rivers takes you through over twenty sets of whitewater rapids, ranging from Class II to IV. Thanks to your expert guides, this exciting trip is great for both new and experienced paddlers alike. 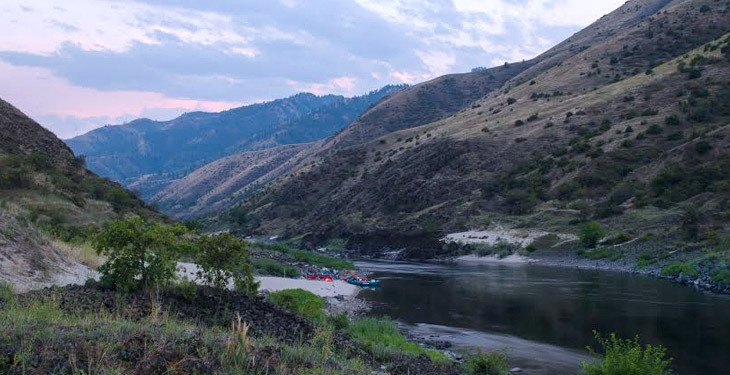 The Salmon River has an abundance of pristine white sand beaches set beneath towering mountains and forested cliffs, making for some of the most scenic riverside camping anywhere in the world. Meals will include generous portions of hearty western fare. 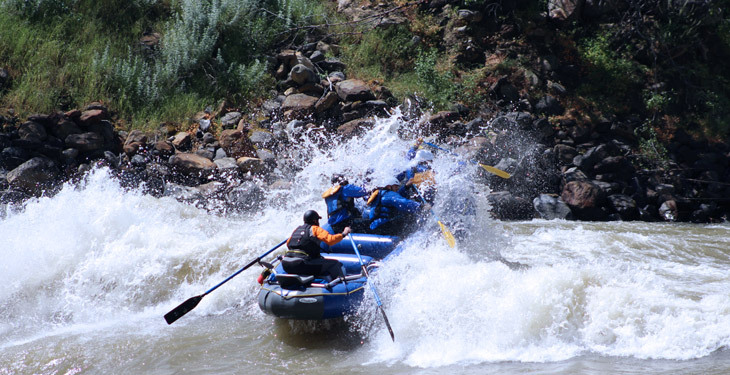 H2O Idaho's rafting guides pride themselves in their dutch oven cuisine, and each morning you'll wake to the smell of freshly brewed coffee. At night, you can choose to tent camp or just sleep out under the blanket of the Milky Way. The deep gorge frames the clear western night sky, revealing an incredible starry view in this remote wilderness. Arrive at the put-in location, Heller Bar Recreational Site, near Whitebird, Idaho. You'll meet your guides and start your descent of the lower Salmon River. Sit back and relax in one of the rafts, admire the breathtaking scenery, and listen as the guides tell tales down the river. If you're feeling more daring, inflatable kayaks are available for your use. You'll stop for the night and make camp on one of the Salmon's pristine white sand beaches, where you can relax while your guides serve dinner and drinks. Wake to the smell of fresh coffee as your guide prepares an amazing breakfast to start your day. Enjoy thrilling whitewater in the morning and afternoon, with stops along the way to hike up to old homesteads, abandoned mining cabins or Native American petroglyphs. Gather around the campfire at night for a well deserved rest and an amazing dinner cooked by your guides. After dark, you can take in the expanse of the Milky Way in the deep darkness of this remote wilderness. You can choose to sleep in the tents provided by your guides, or just sleep out under the stars and listen to the river flow. After a hearty breakfast, you'll set out on the last leg of the journey. 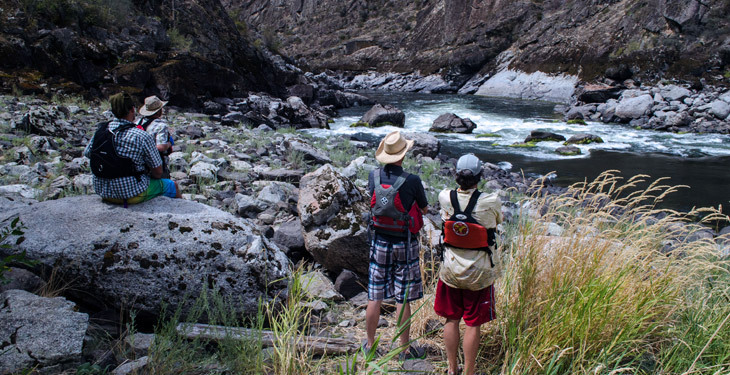 Float or paddle through the majestic scenery of Hell's Canyon gorge to the take-out at Heller Bar. At the trip's conclusion, you'll head back home with memories to last a lifetime. At H2O Idaho, safety is their number-one priority (with having fun as a close second!). Their guides have more than 12 years of experience and are all CPR/First Aid certified. Many also have Swift Water Rescue training and Wilderness Responder training. They will treat you and your family as if you were their own, and your comfort and safety is extremely important to them. Their day trips float along a stretch of the Salmon River with road access for emergencies. What an experience! The trip was well organized, an exciting adventure, but safe. Other than the rapids, my favorite part was the views of nature and camping under the stars on the beaches after a superb meal. It was really relaxing and the guides provided expert and friendly service. We laughed a lot and made some new friends. I'm interested in wildlife, so the opportunity to see bears, bighorn sheep, trout, partridges and many other birds, as pointed out by the knowledgeable guides, was a treat. The views were breathtaking! I'm a university professor, so on my next trip with H2O Idaho I'm bringing students along for a learning experience! Crew was prepared and obviously have a lot of experience on the Salmon River. We went through some big rapids, got wet and had a blast. There was never a moment where I felt unsafe and my crew leader had control the whole time. Besides the awesome team, the Salmon River was gorgeous! Saw an osprey catch a fish out of the river right in front of me. I'll definitely be coming back to this company! We had the most amazing time with H2O Idaho. 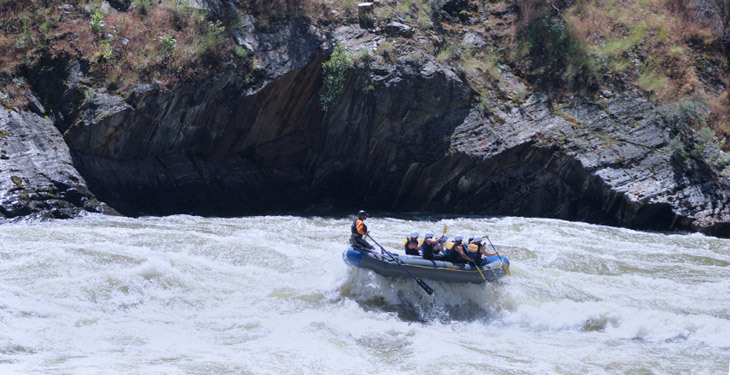 Initially we had only booked a fishing trip with them, but after the amazing time we had on the fishing trip we decided to book a white water rafting trip also. The guides are amazing, very personable, and knowledgeable about the river! We had four adults and a nine year old on our rafting adventure and a great time was had by all! We look forward to booking a longer trip in the future the next time we are in Idaho! We had an amazing family vacation on the Lower Salmon 4-day trip! The scenery, food and customer service were beyond compare! We will be making H2O Idaho and the Lower Salmon part of our yearly vacation. Please note there is a minimum of 4 participants required in order to guarantee each departure. 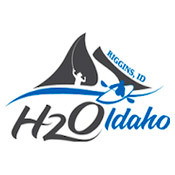 Please wait until you receive confirmation from H2O Idaho before making any travel arrangements. Plan to fly into Boise (BOI) or Spokane (GEG). From Boise you can rent a car and take I-84 west to US-95 north and be there in 3 hours. From Spokane you take US-95 south and be there in 4 hours. When the trip is over, how do I get back to the start location? Customers will be responsible for shuttling their vehicles to the take-out and can contact H20 Idaho directly to help arrange this. What are the accommodations like? Can solo travelers get their own tent? 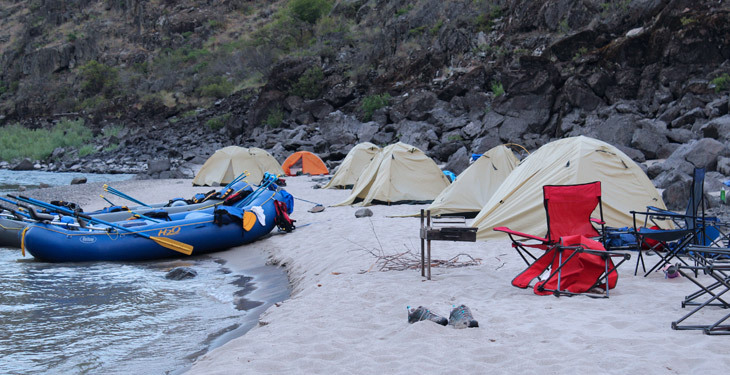 You'll be camping by the river, out under the stars in shared tents. H2O Idaho will provide landing pads, sleeping bags and tents. If you are a solo traveler and would like your own tent, you'll need to request this directly with H2O Idaho. There is no extra charge for individual tents requested in advance. The Salmon River guides pride themselves in their dutch oven cuisine. Steak and salmon feasts along with bountiful breakfasts are the norm with plenty of fresh bread, fruits, and vegetables. A smorgasbord of deli items are served at lunch to satisfy even the most particular dieter. Prescription drugs, allergy medicines, etc., or any special dietary needs (packed to handle bumps). These will be carried in dry bags, accessible at all times. Please… no dogs, stereos or cell phones. Most things you'll need are included in the trip cost. However, you'll want to budget extra money for tips which should be approximately 20% of the trip price. Book confidently with Free Cancellations within 72 hours of booking. After 72 hours, cancellation fees will apply. Cancellations are subject to the full discretion of H2O Idaho. For more information on our Travel Cancellation Policy please Click Here.